Moving to a new PC? Upgrading to Windows 7? 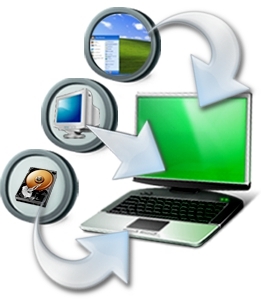 Worried about your old programs and files? "The entire system is transferred to the new one. Applications, files, background settings, and so on!" "Aren't ready to let go of XP as you upgrade to Windows 7? Zinstall can help!" "5 Star Product, Even Better Support (if that's possible)"
Zinstall XP7 takes you to your new computer with a single click. Your entire digital life is transferred - files, applications, settings, your entire desktop. No spending days tediously reinstalling all applications, configuring them, copying data back and forth. Everything works just like it did before, and all your applications behave exactly the same as on the old system. Got a new computer and need to transfer everything from the old one? Upgrading your computer to Windows 7? No matter the scenario, Zinstall XP7 will do the job! Move to your new system now - click here!